A choice of well-balanced, tasty meals is produced in the school’s own kitchen by Hertfordshire Catering Ltd, and these are paid for weekly in advance on the first morning of the school week. Payment for school meals should be sent in an envelope, clearly labelled with the child’s name and class, to the class teacher. Parents who wish to pay half-termly or termly in advance by cheque (payable to Herts.Catering Ltd) are very welcome to do so. We will only be able to provide a dinner for all children in Reception or Key Stage 1, for free school meal pupils in KS2, or where meals have been paid for in advance or on the day. We are no longer able to build up any dinner money debt due to Government changes. Any future debt would be taken out of the school budget, which would have a detrimental effect on the education of our pupils. Please do not put us in the position of not paying for a meal but still expecting us to provide one. Refunds will be given at the end of the term or half-term when children have been absent or have missed meals. 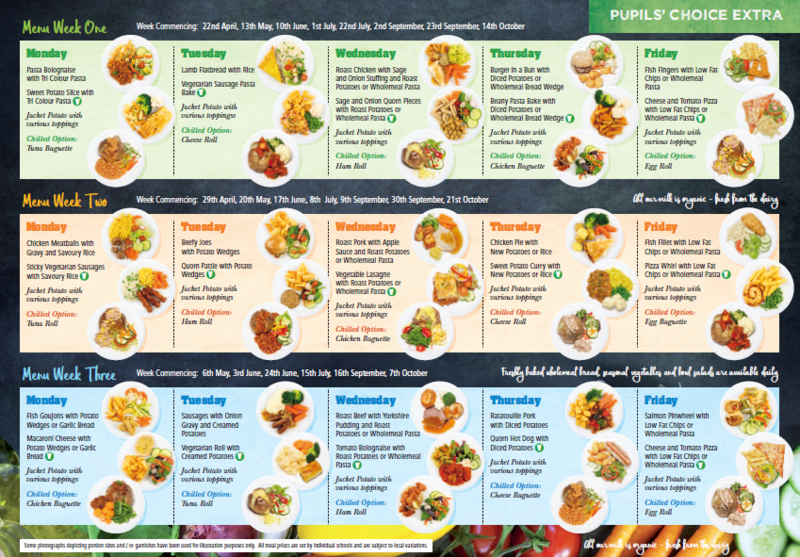 We run the Pupil Choice Menu which includes a nutritious packed lunch and vegetarian option. Menus are sent out termly to help you choose with your child. Please view the current menu below. Free school meals are available to all children in Reception and Key Stage 1. Families in receipt of Income Support via Children, Schools and Families can also qualify for free school meals in Key Stage 2. You can apply on-line or through school using the Free School meals application letter. Please see further information about Free School Meals on the HCC website. Packed lunches brought in from home, must be stored in a clearly-named, secure container. The lunch-boxes will be deposited in the classroom at the beginning of the day and collected as the children go to the dining-room. Please make sure that the contents of the lunch box do not include any glass bottles, cans, thermos flasks, hot liquids, fizzy drinks, nut products and sweets, all of which are not allowed for safety reasons. So that the children can be properly accounted for, those having a packed lunch are entered on the dinner-register. We do ask for a minimum of a week’s notice if children are changing from School Meals to Packed Lunches, or vice-versa. Cartons of milk are available, at an additional cost, to all children in the school. Milk is free for Nursery age pupils and Foundation/KS1 children entitled to Free School Meals. If you would like your child to benefit from this, please let his/her teacher know, or collect an order form from the School Office. All KS2 children will have to pay for their milk. Please let the office know.